Hier is Dudu met haar “Vuitton tasse” op reis – Lui Bosasa ‘n klokkie? Vuitton belonged to a laboring-class family and his ancestors were milliners, farmers, carpenters and joiners unlike him. At the age of ten, his mother died and father remarried soon. Vuitton’s stepmother was harsh, wicked and severe just like the one seen in Cindrella. However, he was a headstrong and willful child, who escaped, from his stepmother’s antagonizing, to Paris in 1835 when he was fourteen years old. Agrizzi saw a Louis Vuitton handbag stuffed with R300 000 for her at Bosasa’s offices. This handbag was delivered to Myeni, who thanked Agrizzi for it. “She was over the moon,” he told Zondo. Myeni, a close friend of Zuma, a former chairperson of the SAA board and chairperson of Zuma’s foundation, was important to Bosasa, Agrizzi testified. She had influence in government and could “swing deals”. The state capture caravan continued to trek into the wilderness of grand corruption on Monday, with former Bosasa executive Angelo Agrizzi testifying at the Zondo commission of inquiry about journalists on the company’s payroll and how Dudu Myeni, a close friend of former president Jacob Zuma, was roped in. This is what emerged on day eight of Agrizzi’s testimony: Gavin Watson, the Bosasa supremo, was worried that Myeni was not delivering all of the money meant for Zuma’s foundation and asked him about it directly. Zuma responded “yes” when Watson asked him whether the money was received, saying he did get monthly payments from Myeni. At the meeting between Watson and Zuma, the Bosasa CEO put a bag full of money next to the president. After testifying last week that Bosasa paid journalists to write positive stories about the company as well as provide them with information, he named Pinky Khoabane, a former columnist for the Sunday Times, one “Bongs” who was a journalist in the Eastern Cape and “Ntuli”, who used to work for The Star or the Sunday Times. Bosasa also had Stephen Laufer and Benedicta Dube on its payroll. They worked as media consultants. Dube was paid to intimidate and harass journalists, including Adriaan Basson and Carien du Plessis, who exposed the Bosasa network and related corruption. The company actively tried to discredit and link them to “the Stellenbosch people”, Agrizzi testified. Deputy Chief Justice Raymond Zondo has called on the investigating team to provide the commission with a full list of all government contracts with Bosasa, past and present. Watson was “quite open” about the fact that he paid Myeni R300 000 monthly. If accepted by the state capture inquiry, this evidence places Myeni in the same hotel where Agrizzi claims she had met them to hand over a pack of confidential documents about the status and progress in the criminal investigation into the controversial company. Agrizzi testified to how the former SAA chairperson Myeni allegedly facilitated meetings between Bosasa and Zuma, that she put in requests for the company to provide event catering in Zuma’s name (amounting to more than R3-million a year), and how she allegedly collected R300,000 a month in cash, ostensibly for the Jacob G Zuma Foundation, which she also chairs. The world knows that some brands provide high quality fashion products and one such well-known brand is named after the French entrepreneur, Louis Vuitton. He was not only a businessman, but a designer as well. Before establishing this world famous company, he use to make trunks for Napoleon‘s wife. Along the way to the city from his hometown Anchay, Vuitton did several unusual jobs to gather enough money for his food. He rested wherever he found shelter. It took him two years to reach the capital of France. At the time, the city was surrounded by the different effects of the industrial revolution – some were good like rapid development of the city, and some were as bad as a distressing plague and dismal poverty. In Paris, Vuitton in his teenage years worked as a trainee in Monsieur Marechal‘s workshop of box making and packing. This was a highly respectable craft in nineteenth century Europe. In a few years, Vuitton became one of the best practitioners of this new skill among the fashion lovers of Paris. 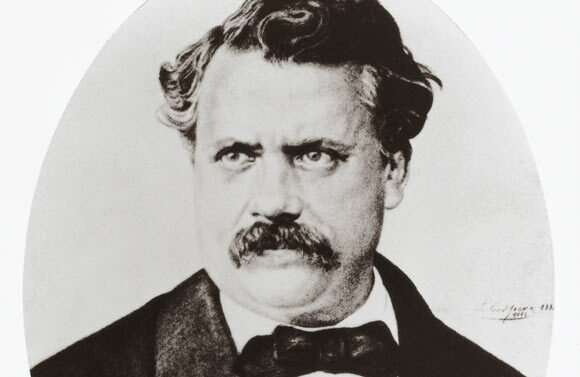 In 1852, Louis Vuitton benefited a lot from the restoration of the French Kingdom under the rule of Napolean III. His wife Eugenie de Montijo, France’s Empress hired Louis Vuitton to work privately as her box packer and maker. This wonderful opportunity became a doorway to success for Vuitton and he received assignments from royal and elite clientele throughout his life. Two years later, Vuitton got married to Clemence-Emilie Parriaux. When he left Marechal’s shop, he opened his own shop of the same business of box manufacturing. In 1958, he introduced a revolutionary shaped trunks to the market and it became a hit. The new design was loved and the demand increased for these convenient and innovative trunks so much that Vuitton expanded his workshop and business in Paris. In 1867 at Exposition Universelle, Vuitton won a bronze medal. It was an international show which Napolean organized in Paris and it further accelerated Vuitton’s work popularity. However, Vuitton’s shop was destroyed and looted between 1870 and 71. This happened while the Franco-Prussian War was in progress and once it ended, Vuitton re-established his workshop in an upper-class area in Paris. In 1872, he introduced a new design of trunks with a red and beige stripe. The elite class Parisians were attracted to Louis Vuitton’s latest creation and his brand sustained a position as offering luxurious and quality trunks. In 1889, he was given a grand prize and a gold medal at the same event, Exposition Universelle. This again strengthened Vuitton’s position in the market and boosted his work’s popularity. With his commitment, aesthetic sense and business skills, Vuitton kept on working until his death in 1892. He left his company over the shoulders of his son, Georges Vuitton. His son carried on his father’s tradition by introducing innovative designs of trunks to the market. Today the Louis Vuitton brand offers additional things than just trunks, including leather accessories and fashion goods, like bags, shoes, sunglasses and much more. Fake fashion is a $450 billion dollar business. The bigger the brand name, the bigger the payoff for counterfeiters such as fake Louis Vuitton bags. Its signature series of canvas monogram bags is a prime target for knock-off artists and manufacturers. Many of these counterfeit Louis Vuitton bags are so convincing, they easily fool the average consumer. If you are in the market for the real deal, here’s how to make sure you’re not getting gypped.